Neutrophil trans-epithelial migration in response to mucosal bacterial infection contributes to epithelial injury and clinical disease. An in vitro model has been developed that combines pathogen, human neutrophils, and polarized human epithelial cell layers grown on transwell filters to facilitate investigations towards unraveling the molecular mechanisms orchestrating this phenomenon. Kusek, M. E., Pazos, M. A., Pirzai, W., Hurley, B. P. In vitro Coculture Assay to Assess Pathogen Induced Neutrophil Trans-epithelial Migration. J. Vis. Exp. (83), e50823, doi:10.3791/50823 (2014). Mucosal surfaces serve as protective barriers against pathogenic organisms. Innate immune responses are activated upon sensing pathogen leading to the infiltration of tissues with migrating inflammatory cells, primarily neutrophils. This process has the potential to be destructive to tissues if excessive or held in an unresolved state. Cocultured in vitro models can be utilized to study the unique molecular mechanisms involved in pathogen induced neutrophil trans-epithelial migration. This type of model provides versatility in experimental design with opportunity for controlled manipulation of the pathogen, epithelial barrier, or neutrophil. Pathogenic infection of the apical surface of polarized epithelial monolayers grown on permeable transwell filters instigates physiologically relevant basolateral to apical trans-epithelial migration of neutrophils applied to the basolateral surface. The in vitro model described herein demonstrates the multiple steps necessary for demonstrating neutrophil migration across a polarized lung epithelial monolayer that has been infected with pathogenic P. aeruginosa (PAO1). Seeding and culturing of permeable transwells with human derived lung epithelial cells is described, along with isolation of neutrophils from whole human blood and culturing of PAO1 and nonpathogenic K12 E. coli (MC1000). The emigrational process and quantitative analysis of successfully migrated neutrophils that have been mobilized in response to pathogenic infection is shown with representative data, including positive and negative controls. This in vitro model system can be manipulated and applied to other mucosal surfaces. Inflammatory responses that involve excessive neutrophil infiltration can be destructive to host tissues and can occur in the absence of pathogenic infections. A better understanding of the molecular mechanisms that promote neutrophil trans-epithelial migration through experimental manipulation of the in vitro coculture assay system described herein has significant potential to identify novel therapeutic targets for a range of mucosal infectious as well as inflammatory diseases. Mucosal surfaces serve as physical and immunological barriers providing protection against external threats pervasive in the environment1,2. This protective epithelial barrier can be compromised when pathogenic organisms invade2. In the case of a bacterial pathogen, this encounter often instigates an inflammatory process by activating the innate immune system and triggering a rapid mobilization of first responder granulocytes known as neutrophils2-4. Chemotactic agents facilitating neutrophil recruitment are produced in part by the mucosal epithelial cells seeking to rid the host of the offending pathogen2-4. Excessive or unresolved neutrophil infiltration of the mucosal epithelial surface can cause significant pathology1,5. This is a consequence of nonspecific tissue damage caused by the anti-bacterial neutrophil arsenal5-7. In such cases, bacterial clearance capacity of neutrophils is overshadowed by destruction of host tissue during an infectious insult. Disruption of the protective epithelial barrier function can lead to enhanced exposure of underlying tissue to microorganisms and/or toxins, further exacerbating disease pathology8,9. These consequences can be observed in multiple organ systems including the lung and digestive tract1,5. Furthermore, noninfectious inflammatory conditions such as severe bouts of asthma, chronic obstructive pulmonary disease (COPD), acute respiratory distress syndrome (ARDS), and inflammatory bowel disease (IBD) are marked by the pathological breach of the mucosal epithelial barrier by an excessive neutrophilic response4,5,10-12. The complex process of neutrophil recruitment following mucosal infection involves several compartmentalized steps1,5,13,14. First, neutrophils must depart from circulation via a series of cell-to-cell interactions that facilitate trans-endothelial migration1,13. Neutrophils next navigate existing interstitial space containing extracellular matrix1,14. To reach the lumen of the infected mucosa, neutrophils must then migrate across the epithelial barrier1,4,5. This intricate multistep phenomenon is often investigated in aggregate using in vivo animal models of infection15. Such models are useful for establishing the necessity of specific factors, such as chemokines, adhesion molecules, or signaling pathways that participate in the overall process but are largely inadequate for resolving molecular contributions critical for each distinct compartmentalized step16. Cocultured in vitro systems modeling trans-endothelial, trans-matrix, or trans-epithelial migration of neutrophils have been particularly useful in this regard1,14,16,17. A robust coculture assay system has been developed for the purpose of deciphering mechanisms responsible for neutrophil trans-epithelial migration in response to pathogenic infection18-22. This model involves infecting the apical surface of polarized human epithelial cell layers with a bacterial pathogen followed by application of freshly isolated human neutrophils to the basolateral surface18-22. Neutrophils migrate across the epithelial barrier in response to epithelial-derived chemotactic products secreted following pathogenic infection18,21-23. This model system has been employed using intestinal and lung epithelial cultures exposed to appropriate tissue specific bacterial pathogens and has unveiled novel molecular mechanisms likely important to the neutrophil recruitment process during mucosal infection3,8,19,24-28. The strength of this in vitro coculture model is that a reductionist approach enables the investigator to experimentally manipulate the pathogen, epithelial barrier, and/or neutrophil in a well-controlled, highly reproducible, fairly inexpensive system. Insight gathered from this approach can be effectively leveraged to conduct focused analysis of compartmentalized events during neutrophil recruitment using in vivo infection models22,29,30. This article demonstrates the multiple steps necessary for the successful establishment of this reproducible model to explore pathogen induced neutrophil trans-epithelial migration. Lung epithelial barriers infected with the pathogen Pseudomonas aeruginosa are featured in this article; however, other tissue epithelia and pathogens can be substituted with minor modifications. 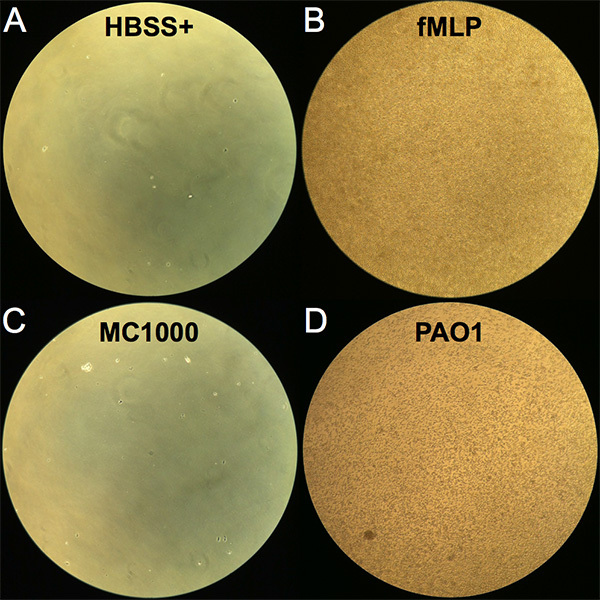 Seeding and culturing of polarized lung epithelial cell layers on inverted collagen coated permeable transwell filters is detailed herein, as is the growth of pathogenic P. aeruginosa and the isolation of neutrophils from whole blood. How these components are combined to observe pathogen induced neutrophil trans-epithelial migration is presented along with appropriate positive and negative controls to establish a reproducible assay. The versatility of this approach to examine various aspects of pathogen induced neutrophil trans-epithelial migration is discussed with reference to specific studies in the literature. Steps (1-3) should be performed in a sterile environment under a laminar flow hood. Make a 30 µg/ml collagen solution. Dilute 3 mg/ml collagen stock 1:100 in 60% ethanol that has been passed through a 0.2 µm filter unit. Vortex diluted 30 µg/ml solution. Note: It is not necessary to vortex the 3 mg/ml collagen stock solution, as this solution is quite viscous and air bubbles may be introduced, potentially decreasing accuracy when pipetting. 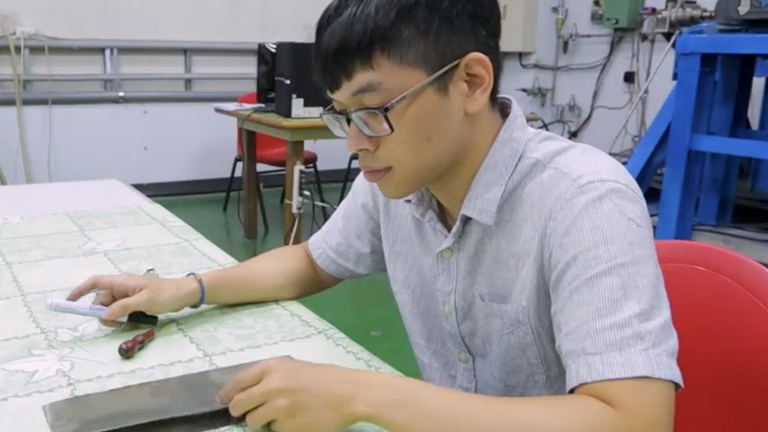 Remove 0.33 cm2 growth area transwells with a pore size of 3 µm from outside packaging and place the 24-well plate containing 12 transwells upside down inside the hood. Turn on Bunsen burner. Flame hemostat for sterility and let cool. With sterile hemostat, transfer transwells to a 150 mm x 25 mm Petri dish, keeping them in the inverted position. Note: Be sure to maintain sterility of the empty 24-well plate plus lid to be used to house transwells once they have been seeded with epithelial cells. Pipette 70 µl of the 30 µg/ml collagen solution onto the filter membrane of each inverted transwell. Note: Surface tension should hold this volume of solution in place as there are no walls around the filter membrane when accessing the surface of the underside. Be careful that the collagen solution does not drip down the side of the transwell and avoid moving transwells during the coating procedure. Leave the lid of the Petri dish off for a minimum of 4 hr to allow ethanol solution to evaporate. To maintain sterility during this process keep the hood fan and the ultraviolet light on. After the transwells have dried, they can be used immediately or stored at room temperature for up to a week provided the Petri dish cover is in place and sterility is maintained. Prepare culture medium by adding 10% heat-inactivated Fetal Bovine Serum (HI-FBS) and 1x Penicillin/Streptomycin to RPMI 1640. Warm media, trypsin-EDTA (T-EDTA), and D-PBS in 37 ºC water bath. Remove T-75 flask containing cells from incubator and assess confluence visually with inverted microscope. Note: When using H292 cells, flasks should be close to or fully confluent. Aspirate media from flask. Reduce length of time that cells are dry by having next solution in hood with cap loosened. Add 5 ml D-PBS to T-75 flask and swirl. Avoid creating bubbles. Remove PBS by aspiration. Add 3 ml T-EDTA to T-75 flask and swirl to cover bottom. Remove most of T-EDTA, leaving approximately 0.3 ml in T-75 flask. Distribute the small remaining volume of T-EDTA over the surface area of the cells and place in a humidified incubator under standard culture conditions (37 ºC, 5% CO2). After a period of time, remove flask from incubator. Note: Cells should readily detach from the surface of the flask by gently tapping the flask on its side. Cells should now be rounded and floating when visualized under the microscope. The average time this will take for H292 cells is 5-10 min. Add 10 ml culture media to flask to neutralize T-EDTA and resuspend cells. Draw up the cell solution into pipette tip and eject onto surface of flask containing cells approximately five times to resuspend all cells. Transfer resuspended cells to a 15 ml tube for seeding transwells. Note: The concentration of resuspended H292 cells prepared in this manner should range between approximately 1 x 106-1.8 x 106 cells/ml. Add 70 µl of resuspended cell solution from the 15 ml tube to each inverted collagen coated transwell. Note: H292 cell solutions with a concentration range between 1 x 106-1.8 x 106 cells/ml will yield approximately 70,000-120,000 cells/transwell. Mix the cell suspension by gently inverting tube periodically to prevent cells from settling to the bottom of the 15 ml tube while seeding the transwells. Note: Do not vortex cells and be cautious that pipette tip does not come in direct contact with collagen coated membrane filter. Once all inverted transwells have been seeded with epithelial cells, replace Petri dish cover and carefully place in the tissue culture incubator, humidified, 37 ºC, 5% CO2. Take care to avoid disturbing the cell suspension that has been added to the collagen coated filter membrane. Maintain inverted transwells in the tissue culture incubator, humidified, 37 ºC, 5% CO2 overnight. Note: The bubble of liquid containing cells should remain associated with the permeable filter membrane of the transwell throughout the overnight incubation. If the filter membrane becomes dry due to evaporation of liquid or because the liquid drips down the side of the transwells, the epithelial layers may not grow properly. The following day, add 1 ml media into the original sterile 24-well plate and flip each inverted transwell using a sterilized hemostat into each well containing 1 ml of media. Add 0.2 ml media into the top chamber of each transwell and return to tissue culture incubator, humidified, 37 ºC, 5% CO2. H292 inverted transwells can be used from 8 days up to 1 month following seeding. Note: We suggest waiting a minimum of 8 days post seeding of transwells to ensure that the epithelial monolayers have fully formed and exhibit a functional barrier. One can test the H292 epithelial barrier by determining whether the monolayer is capable of restricting trans-epithelial flux of the protein horse radish peroxidase (HRP) following addition to the basolateral surface18. One day prior to experiment, extract one colony of P. aeruginosa PAO1 from a Pseudomonas Isolation Agar plate and one colony of K12 E. coli MC1000 from a Luria-Bertani (LB) Agar plate and place into separate tubes containing 3 ml of LB broth. CAUTION: P. aeruginosa is a human pathogen, standard BSL2 safety measures should be adopted when handling this organism. Shake overnight at 225 rpm in a 37 ºC environment. Next day, remove 1 ml from the dense bacterial cultures and place into 1.5 ml Eppendorf tubes. Spin in microfuge at 15,800 x g for 5 min and then remove supernatant. Prepare Hanks’ Balanced Salt Solution with calcium and magnesium (HBSS+) in advance. Add 23.8 g HEPES and 97.5 g HBSS+ powder to 9.5 L distilled water. Add small quantities of 10 M NaOH to solution, while monitoring pH until a stable pH of 7.4 is reached. Bring volume up to 10 L and store at 4 ºC. Resuspend each bacterial pellet with 1 ml HBSS+. Vortex to be sure an even bacterial suspension is achieved. Spin again at 15,800 x g for 5 min and remove supernatant. Resuspend the PAO1 pellet with 0.6 ml HBSS+ and the MC1000 pellet with 0.5 ml HBSS+. Vortex the bacterial suspensions. 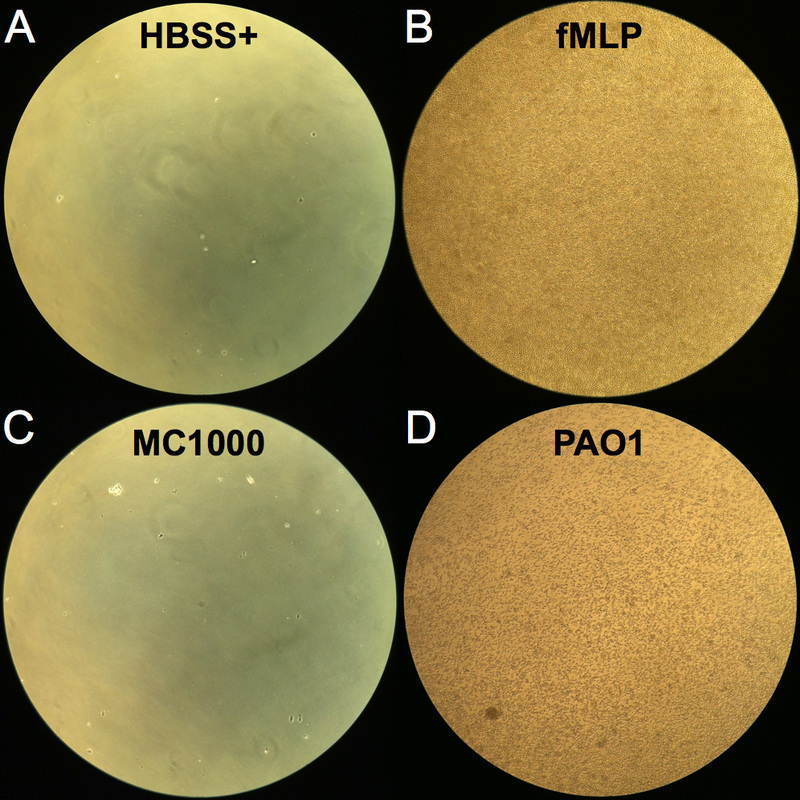 Further dilute the PAO1 and MC1000 resuspended pellets 1:100 in HBSS+. For example, add 50 µl of the 0.6 ml PAO1 resuspended pellet to 5 ml HBSS+. Note: Using optical density (OD) measurements to determine culture density as well as standard colony forming unit (CFU) dilution plating methodology, PAO1 and MC1000 solutions prepared in this manner consistently yield between 3 x 107-6 x 107 CFU/ml. The density of a bacterial culture is positively correlated with the OD measurement of the culture at 600 nm and this correlation can be used to estimate the bacterial cell concentration. To confirm the bacterial cell concentration, the culture can be diluted to a very low estimated concentration and plated on an agar plate such that one would expect between 30-200 bacterial cells to be present on the plate. The cells are spread across the plate and incubated overnight at 37 ºC such that each cell forms an individual colony of cells that is large enough to be visible and colonies can then be counted. Acid citrate dextrose solution (ACD) is used as an anticoagulant and prepared by adding 6.9 g citric acid, 12.5 g sodium citrate, and 10 g dextrose to 500 ml distilled water. Once all components are dissolved, the ACD solution is sterilized by passing through a 0.2 µm filter unit. Store ACD solution at 4 ºC. Prior to drawing blood, add 5 ml ACD to 50 ml syringe and attach 21 x ¾ G butterfly needle with 12 in tubing. Apply tourniquet, wipe vein with alcohol, and insert needle. Note: Any research protocol involving human subjects must be approved by an institutional review board and written informed consent must be provided from each blood donor. For example, experiments conducted using this protocol were approved by Massachusetts General Hospital Institutional Review Board and assigned protocol #1999-P-007782. Slowly draw 45 ml of blood ensuring that blood mixes with ACD once in the syringe. When 45 ml has been drawn (50 ml total volume), untie the tourniquet before removing the needle. Immediately apply pressure to wound with sterile gauze when needle is removed. Transfer blood slowly down the side of a 50 ml tube over approximately 5-10 sec. Spin in centrifuge at 1,000 x g with the brake deactivated for 20 min at room temperature. Note: An additional step involving dilution of whole blood in PBS- and careful overlay of diluted blood onto Ficoll-Paque prior to centrifugation can be employed to achieve a slightly higher level of neutrophil purity by more efficiently separating the buffy coat from the granulocytes8. Omitting this step serves to save time without drastically impacting yield or purity for the purposes of this assay, and thus we favor not including the blood overlay onto Ficoll-Paque step. While blood is spinning, very slowly add 1 g gelatin into 50 ml heated Hanks’ Balanced Salt Solution without calcium and magnesium (HBSS(-)) to prepare 2% gelatin solution. Keep solution at 37 ºC. Aspirate and discard plasma from the 50 ml tube of blood using a glass pipette tip that has been treated with Sigmacote. Continue aspirating very carefully to remove the buffy coat, which contains white blood cells, including lymphocytes. As the buffy coat is slowly being removed, the whitish yellow cloudy material above the red blood cell (RBC) layer will disappear. Cease aspiration once buffy coat is removed and RBC layer can be clearly visualized when viewing from above the tube. Try not to disturb the RBC layer as granulocytes, mostly neutrophils, are near the surface of the RBC layer, but are not visible. To a volume of 15 ml RBC layer, add 30 ml warm 2% gelatin solution (2x volume of the RBC layer). Invert tube gently to mix, taking care to minimize formation of bubbles. Incubate at 37 ºC for 25 min. Note: RBCs should aggregate and settle to the bottom. As an alternative to gelatin, large molecular weight dextrans can be employed to sediment RBCs8. After incubation, transfer top layer light reddish solution that contains granulocytes into a new 50 ml tube with pipette, being careful not to disturb the settled dark RBC layer during transfer. Once separated, discard dark RBC layer. Spin transferred light reddish solution containing granulocytes and some RBCs in centrifuge at 1,000 x g with brake activated for 10 min at room temperature in order to pellet cells. Pour off or aspirate the supernatant carefully, as the reddish cell pellet that will form following centrifugation is generally loose. Prepare RBC lysis buffer in advance and store at 4 ºC by adding 8.29 g ammonium chloride (NH4Cl), 1 g sodium bicarbonate (NaHCO3), and 0.038 g EDTA to 1 L distilled water in a beaker. Store RBC lysis buffer at 4 ºC. Resuspend and break up reddish cell pellet with a small volume of cold RBC lysis buffer. Once the cell pellet is in solution, fill tube to 50 ml with RBC lysis buffer. Note: At this point and going forward, keep the cells on ice or at 4 ºC. Spin in centrifuge at 300 x g for 10 min at 4 ºC and then pour off or aspirate the supernatant. Note: The supernatant will be somewhat reddish containing lysed RBCs. The pellet should be yellowish white at this point. If significant RBCs remain in the pellet as indicated by a reddish pellet, step 5.20-5.21 can be repeated. Significant RBCs remain in the cell pellet if the reddish pellet from step 5.20 is not broken up sufficiently. Resuspend and break up whitish pellet with a small volume of HBSS(-) and then fill tube to 50 ml with HBSS(-). Note: HBSS(-) and not HBSS+ should be used to resuspend the whitish cell pellet. HBSS(-) lacks calcium and magnesium. Spin again in centrifuge at 300 x g for 10 min at 4 ºC. Pour off supernatant and resuspend the pellet to a final volume of 1 ml HBSS(-). Add 5 µl of the 1 ml cell suspension to 250 µl HBSS(-) in a 1.5 ml Eppendorf tube and mix gently up and down by pipette. 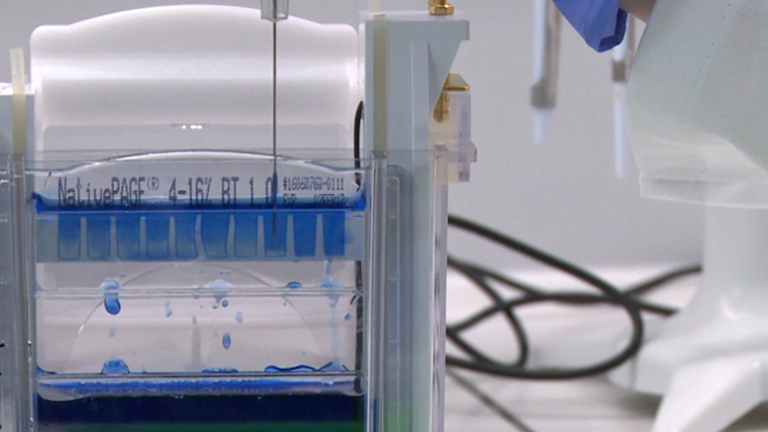 Add 25 µl diluted cell suspension to 25 µl 0.4% Trypan blue. Add 12 µl of mixture to each side of a standard hemocytometer. Count the number of living cells that have excluded the Trypan blue dye and are present in the middle square of both sides of the hemocytometer. To calculate the cell concentration, multiply the average of the 2 squares by 100 (dilutional factor) and then multiply by 104 to give the number of cells/ml. Adjust the final concentration to 5 x 107 cells/ml. If greater than 5 x 107 cells/ml, adjust by adding HBSS(-). If less, pellet the cells and resuspend to appropriate volume. Keep cells on ice until ready for migration assay. Note: These cells represent the granulocyte population of white blood cells. The majority of the granulocytes isolated from whole human blood are neutrophils. Cells are kept on ice suspended in HBSS(-) until addition to the migration assay in order to maintain cells in a quiescent state. Remove from incubator 24-well plate supporting epithelial layers that have been cultured on the underside of transwell filter membranes for at least eight days. Grasp the edge of each transwell with a hemostat, lift out of the 24-well plate and invert the transwell over a waste bucket to discard culture media from the inner chamber of the transwell. Dip each transwell into a wash beaker containing HBSS+ to fill the inner chamber of the transwell with HBSS+. Discard fluid from inner chamber into a waste bucket. Repeat step 6.2 for a second wash in HBSS+. After two washes, place transwells into a new 24-well plate containing 1 ml HBSS+ in each well. Note: All washes should be performed with HBSS+ that is warmed to 37 ºC. Observe the top chamber of each transwell to assess epithelial cell layer integrity. Note: HBSS+ should not leak into and fill the top chamber of the transwell when placed in the well of a 24-well plate containing 1 ml of HBSS+. After carefully observing each transwell, add 0.2 ml of HBSS+ into top chamber. Place in incubator at 37 ºC, 5% CO2 in a humidified chamber for 30-60 min to equilibrate epithelial cell layers. Remove from incubator 24-well plate of washed transwells equilibrating in HBSS+. Grasp each transwell with a hemostat and discard fluid in top well into a waste bucket. Place each transwell upside down in a 150 mm x 25 mm Petri dish. To six of the inverted Transwells, add 25 µl of HBSS+. To three of the inverted transwells, infect with 25 µl P. aeruginosa (PAO1) diluted in HBSS+ prepared as described in step 4. To the final three inverted transwells, infect with 25 µl E. coli K12 (MC1000) diluted in HBSS+ prepared as described in step 4. This is approximately 0.8 x 106-1.5 x 106 CFUs/epithelial layer for each bacterial species since the concentration of the bacterial solutions prepared in step 4 is approximately 3 x 107-6 x 107 CFU/ml. Incubate at 37 ºC, 5% CO2 in a humidified chamber for 60 min. Prepare fMLP as a positive control for neutrophil migration by adding 5 µl of 10 mM fMLP stock to 5 ml HBSS+ giving a 10 µM solution. Wash transwells by grasping with a hemostat and flipping back over into a 24-well wash plate that contains 1 ml HBSS+ in the bottom chambers. Add 0.2 ml of HBSS+ to the top chambers. Grasp transwell with a hemostat and remove from the first wash plate. Prior to placing transwells into a second 24-well wash plate containing 1 ml HBSS+, discard fluid from top chamber into a waste bucket. Add 0.2 ml of HBSS+ to the top chamber. Repeat steps 7.8 one more time for a total of 3 washes. Note: All transwells should be subjected to the same handling and washing regimen, whether or not they have been infected with bacteria, to ensure that all transwells being assayed have been manipulated in the same manner. A 60 min infection with either PAO1 or MC1000 does not reduce viability or alter the barrier properties of the H292 monolayer as assessed by a lactate dehydrogenase based toxicology assay and the HRP flux assay, respectively18,22. Prepare 24-well migration plate by adding 1 ml HBSS+ into 12 wells of the 24-well plate. Note: This plate can be prepared in advance. After the third wash, discard fluid from top chambers of transwells into a waste bucket using a hemostat and place three of the uninfected transwells into three wells of the 24-well migration plate containing 1 ml HBSS+, which represents the negative control. Pipette 10 µl of a 10 µM solution of fMLP into each of three wells of the 24-well migration plate containing 1 ml HBSS+ (100 nM). Place three of the uninfected transwells into three wells of the 24-well migration plate containing 100 nM fMLP, which represents a positive control for the ability of isolated neutrophils to migrate. Place three transwells infected with PAO1 and three transwells infected with MC1000 into three wells each respectively of the 24-well migration plate containing 1 ml HBSS+. Add 0.1 ml of HBSS+ to the top chamber of every transwell. On top of the 0.1 ml HBSS+ in each transwell, carefully add 20 µl of the neutrophil suspension (5 x 107 cells/ml) prepared as described in step 5. Note: This represents approximately 1 x 106 neutrophils/transwell. Incubate at 37 ºC, 5% CO2 in a humidified chamber for 2 hr to allow trans-epithelial migration of neutrophils. Prepare a standard curve for determining the number of neutrophils that have migrated after 2 hr. Add 40 µl of the neutrophil suspension (5 x 107 cells/ml) into 2 ml of HBSS(+) and transfer 1 ml into 1 ml HBSS(+) and perform serial 2-fold dilutions eight additional times for a total of 10 standards ranging from approximately 2,000 cell/ml to 1 x 106 cells/ml. Include 1 ml HBSS(+) for blank. After 2 hr of migration, lift the transwells by grasping with a hemostat and tap gently against the inside walls of the 24-well migration plate. Discard transwells. Assess the migration of neutrophils grossly in the wells by viewing wells of the 24-well migration plate under an inverted microscope using the 10X objective (See Figure 1 for images of migrated neutrophils in each condition). Add 50 µl of 10% triton X-100 to each well used in the 24-well migration plate, each standard, and the blank. Rotate the 24-well migration plate, standards, and blank at low speed for 20 min at 4 ºC. Prepare 1 M citrate buffer in advance. Add 52.5 g citric acid and 73.5 g sodium citrate to 400 ml distilled water in a beaker. Bring pH to 4.2. Add distilled water for final solution of 500 ml. Store solution at 4 ºC. Prepare ABTS substrate solution fresh that day. Add 3 ABTS tablets (10 mg each) and 5 ml of 1 M citrate buffer to 45 ml distilled water. Allow tablets to fully dissolve in solution. Withhold addition of 50 µl of 30% hydrogen peroxide until the ABTS substrate solution is needed (see step 7.27). Add 50 µl of citrate buffer to each well used in the 24-well migration plate, each standard, and the blank. Transfer 100 µl of each sample well in duplicate to a 96-well plate. Note: It is very important to thoroughly mix contents in each sample well prior to moving to the 96-well plate. Pipette the solution up and down at least five times prior to transfer. Transfer 100 µl of each standard and the blank to the 96-well plate after mixing (blank in duplicate). Add 50 µl of 30% hydrogen peroxide to the ABTS solution and vortex. Add 100 µl of ABTS substrate solution to each sample on the 96-well plate. Allow plate to develop for 5-10 min in the dark. Note: A green color should develop in certain wells, correlating with the number of neutrophils present in each well. Read at wavelength of 405 nm using a microplate reader. Calculate the number of neutrophils that have migrated across the epithelial layer using the standards whereby a linear positive correlation exists between the known numbers of neutrophils prepared as standards and the amount of peroxidase activity as measured by optical density at 405 nm (See Figures 2 and 3 for representative data). Note: This method of neutrophil quantification takes advantage of the large amount of peroxidase activity exhibited by neutrophils due to myeloperoxidase expression. Alternative approaches to quantify neutrophils can be considered, such as methods involving prelabeling neutrophils with radioactivity or fluorescence compounds. Several studies have demonstrated that pathogen-infected epithelial layers facilitate neutrophil trans-epithelial migration3,8,19,24-28,31,32. This occurs via a pathogen-specific induction of an epithelial cell-derived neutrophil chemotactic gradient3,23. For example, pathogenic P. aeruginosa interacting with the apical surface of lung epithelial cells causes a substantial number of neutrophils to migrate across the epithelial layer18,22,25,26,33,34. This clinically relevant assay system can be manipulated in numerous ways to unveil key pathogen and host molecular contributors when paired with appropriate controls. Neutrophils added to polarized epithelial cell layers that have not been preinfected fail to migrate across in appreciable numbers. However, application of a chemo-attractant gradient across an uninfected epithelial layer will drive significant numbers of neutrophils across. It is important to include both these negative and positive controls respectively within each assay when investigating neutrophil migration across pathogen infected epithelial layers. The negative control establishes the background number of neutrophils that cross the epithelial layer in the absence of signal. This number should be very low when cultured epithelial cells have established a functional barrier. High background migration complicates interpretation of results achieved with pathogen-infected epithelium. The positive control involves applying a gradient of a neutrophil chemo-attractant such as fMLP across the epithelial layer and serves to confirm that the isolated neutrophils are functional. Further, in the event that epithelial layers are pretreated with certain reagents to assess their impacts on pathogen induced trans-epithelial migration, the fMLP gradient serves to control for any effects the reagent may have on the ability of neutrophils to navigate the epithelial layer irrespective of pathogen mediated effects. An additional control often employed within this assay system involves infection of epithelial layers with nonpathogenic bacteria in parallel with pathogen. This control can be exploited to distinguish relevant epithelial responses following interaction with bacteria as well as assist with the identification of pathogenic factors necessary for stimulating neutrophil trans-epithelial migration. Neutrophil trans-epithelial migration can be assessed both qualitatively and quantitatively. At the completion of the 2 hr incubation following addition of neutrophils to the basolateral surface, transwells are removed and neutrophils that have migrated fully across the epithelial layer to the apical chamber can be viewed in the bottom well of the 24-well migration plate. A representative image of each condition is displayed in Figure 1, visualized using an inverted light microscope. Very few neutrophils were observed to migrate across an uninfected epithelial layer without an imposed chemotactic gradient (HBSS+) and represent background levels in the assay (Figure 1A). 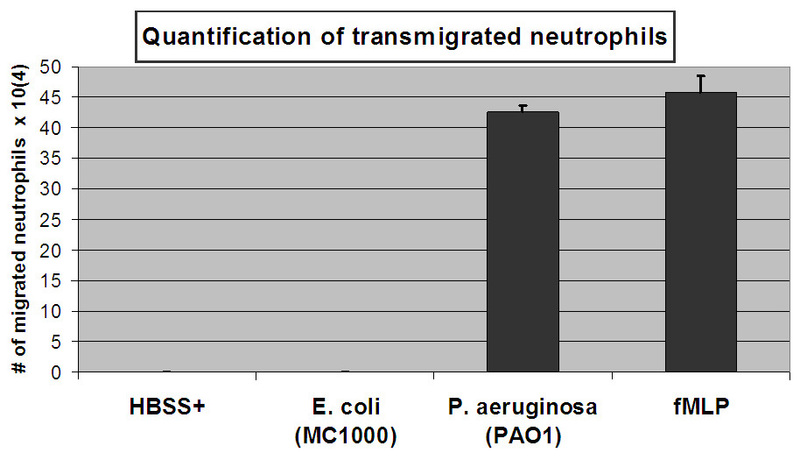 In contrast, an abundance of transmigrated neutrophils were apparent when an fMLP gradient is provided (Figure 1B). Infection of the epithelium with nonpathogenic E. coli MC1000 resulted in few visible transmigrated neutrophils, whereas many transmigrated neutrophils were observable when epithelial layers were infected with the lung pathogenic P. aeruginosa (PAO1) (Figures 1C and 1D). The neutrophils that have migrated in the experiment are quantified by measuring their myeloperoxidase activity. A standard curve is utilized to enable an estimation of the number of transmigrated neutrophils. The number of neutrophils positively correlates with the amount of peroxidase activity measured following lysis of neutrophils with values exhibiting a linear relationship in the range of neutrophil numbers selected for the standard curve (2 x 103-1 x 106 cells/ml) (Figure 2). A significant number of neutrophils migrate across epithelial layers in response to a provided fMLP gradient or in response to an epithelial layer infected with PAO1 (Figure 3). The number of neutrophils that migrate in the absence of stimuli (HBSS+) or following apical epithelial infection with nonpathogenic E. coli MC1000 is below the limit of detection for the assay (Figure 3). 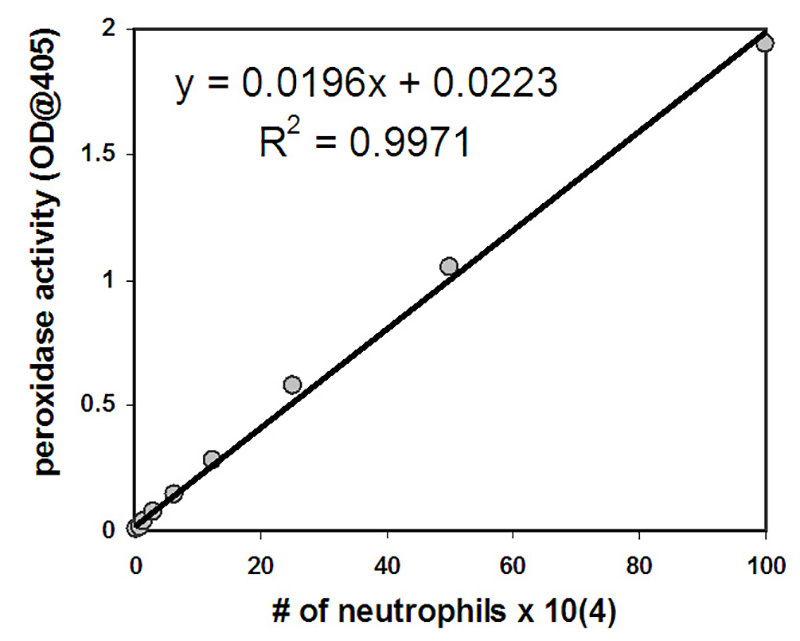 Data presented in Figure 3 represent the average number of transmigrated neutrophils with error bars representing standard deviation of three independent wells / condition. Quantitative data depicted in Figure 3 is consistent with representative well images displayed in Figure 1. Figure 1. Image of neutrophils following trans-epithelial migration. Images were viewed with an inverted light microscope at 10X magnification of the bottom well (apical chamber) of the 24-well migration plate following the 2 hr incubation period with neutrophils added to the top well (basolateral chamber). (A) Negative control HBSS+. (B) Positive control imposed fMLP chemotactic gradient. (C) Epithelial cell layers infected with nonpathogenic E. coli K12 (MC1000). (D) Epithelial cell layers infected with pathogenic P. aeruginosa (PAO1). Click here to view larger image. Figure 2. Neutrophils at a starting concentration of 1 x 106 were subjected to nine 2-fold dilutions. Following lysis, the amount of peroxidase activity was determined and the number of neutrophils was graphed on the x-axis with peroxidase activity on the y-axis. The equation depicted can be used to determine the number of neutrophils present in each well following transmigration based on the amount of peroxidase activity measured in each well. Click here to view larger image. Figure 3. Quantification of transmigrated neutrophils. The number of transmigrated neutrophils is quantified by relative myeloperoxidase activity to a linear standard curve of known numbers of neutrophils. Substantial numbers of transmigrated neutrophils were observed following epithelial cell infection with pathogenic P. aeruginosa (PAO1) or establishment of an apical to basolateral gradient of neutrophil chemo-attractant fMLP. Undetectable numbers of transmigrated neutrophils were observed following epithelial cell infection with nonpathogenic E. coli K12 (MC1000) treatment or negative control buffer only (HBSS+). Click here to view larger image. Neutrophil migration across mucosal epithelial surfaces is a common feature in disease pathology following infection with bacterial pathogens3. The methodology described herein offers a rapid, straightforward approach to experimentally isolate this discrete event using a human cell derived in vitro coculture assay system that models a feature of the inflammatory process triggered by bacterial infections. This system was originally developed using polarized intestinal epithelial cells infected with enteric pathogens including Salmonella typhimurium, Shigella flexneri, and various pathogenic E. coli8,19,24,27,28. Each of these pathogenic organisms is capable of driving neutrophils across polarized intestinal epithelial monolayers grown on inverted collagen coated permeable transwell filters. This experimental system has been adapted with modifications to explore lung epithelial barriers and pathogen induced neutrophil trans-epithelial migration18,26. Several airway epithelial cell lines apart from H292 have been used for these studies including commonly cited A549, BEAS-2B, and Calu-3 lung epithelial cell lines22,26. P. aeruginosa instigates inflammation in the lung causing significant damage characterizing diseases such as acute pneumonia and cystic fibrosis35,36. As described, the lung pathogen P. aeruginosa readily induces neutrophil trans-epithelial migration upon infection of lung epithelial cells, a notable feature of the inflammatory process observed in pneumonia and cystic fibrosis. Furthermore, several additional strains of P. aeruginosa including clinical isolates from cystic fibrosis patients have been validated as inducers in this assay25. Streptococcus pneumoniae and Klebsiella pneumoniae, Gram-positive and Gram-negative bacterial pathogens, respectively, are commonly associated with pneumonia and have been shown to be capable of inducing neutrophil trans-epithelial migration using the in vitro coculture model26,32. Thus, this model system offers a robust in vitro approach using human derived cells to explore inflammatory processes instigated by mucosal pathogens. Standard tissue culture based models often used to explore host pathogen interactions generally employ epithelial cells grown on flat plastic surfaces16. The in vitro coculture assay offers a larger degree of complexity providing versatility in experimental design16,37,38. Polarized epithelial cells grown on the underside of permeable transwell filters creates an apical compartment that faces the bottom chamber when placed in a 24-well plate and a basolateral compartment that faces the inside top well of the transwell14,17. This discrete compartmentalization and directional orientation allows for the analysis of physiologic basolateral to apical migration of neutrophils in response to imposed or epithelial cell-generated chemotactic gradients14,17,23. The in vitro coculture system enables the investigation of specific molecular mechanisms attributable to trans-epithelial migration, which can be difficult to resolve in the complex milieu of an in vivo model of pulmonary infection1,15. Any finding regarding the identification of key factors involved in neutrophil trans-epithelial migration using the in vitro coculture model can subsequently be validated for relevance using in vivo models of acute pneumonia15,22. The in vitro coculture assay can be manipulated in numerous ways to study a range of phenomena. Studies focused on bacterial genes contributing to neutrophil recruitment can be performed by assaying available mutant libraries for specific pathogens of interest25,39,40. Genes revealed from such analysis may represent novel virulence factors and potential therapeutic targets for anti-infective agents. The neutrophil can also represent the focus of analysis. For example, neutrophils employ several cell surface adhesion molecules to facilitate trans-epithelial migration5,14,34,41,42. Key cell-to-cell interactions can vary depending on the chemo-attractant driving migration and the tissue with which the neutrophils are interacting34. Neutrophils can be pretreated with inhibitors, antibodies, or antagonists prior to assessing pathogen induced trans-epithelial migration in order to identify surface molecules or signaling pathways that are critical for this process22,34. Epithelial cells serve a critical role during infection and inflammation by sensing signals and communicating with immune cells through soluble mediators43. Signaling pathways, polarized secretion of chemo-attractants, and epithelial surface adhesion molecules interacting with either bacteria or neutrophils that impact pathogen induced neutrophil trans-epithelial migration can all be investigated using the in vitro coculture assay. Application of this coculture model revealed the importance of a previously unappreciated lipid eicosanoid chemo-attractant known as hepoxilin A33,18,21. Hepoxilin A3 is produced by both lung and intestinal epithelial cells in response to infection with specific pathogens and is responsible for driving neutrophils across the polarized epithelial monolayer from the basolateral to the infected apical side3. Thus the in vitro coculture assay serves as a robust exploratory tool with the potential to identify critical mechanisms that mediate host-pathogen interactions and orchestrate inflammation. Further, this model system has the potential to be adapted as a high throughput screening approach to assess effectiveness of selective anti-infective or anti-inflammatory therapeutics. In summation, we provide a detailed step-by-step protocol for investigating the migration of neutrophils across a monolayer of pathogen-infected lung epithelial cell layers grown on permeable transwell filters. Techniques described herein can be modified to study neutrophil migration across other mucosal surfaces where neutrophils infiltrate in disease states such as the gastrointestinal tract or the genitourinary tract. In addition, insights gained using the in vitro coculture assay system is likely relevant to a wide range of inflammatory diseases not driven by specific infectious agents. Inflammatory diseases of the mucosal surfaces that feature neutrophils crossing the protective epithelial barrier to a pathological degree include COPD, ARDS, asthma, and IBD5,10-12. A deeper understanding of the molecular mechanisms that govern neutrophil trans-epithelial migration will likely inform therapeutic strategies geared towards alleviating destructive inflammatory processes associated with these common ailments, providing new avenues to improve human health. This work was supported financially by NIH (1 R01 AI095338-01A1). Penicillin-Streptomycin Invitrogen 15140-122 100x: 10,000 units of penicillin and 10,000 µg of streptomycin per ml. Trypsin-EDTA (0.05%) Invitrogen 25300-062 50 ml aliquots are stored frozen at -20 ºC. Aliquot in use can be stored at 4 ºC short-term. N-Formyl-Met-Leu-Phe (fMLP or fMLF) Sigma-Aldrich F-3506 A Stock solution of 10 mM in DMSO should be prepared and aliquots stored at -20 ºC. Petri dish Falcon 35-1013 Each Petri dish holds 24 inverted 0.33 cm2 Transwells. Burns, A. R., Smith, C. W., Walker, D. C. Unique structural features that influence neutrophil emigration into the lung. Physiol. Rev. 83, 309-336 (2003). Hurley, B. P., McCormick, B. A. Intestinal epithelial defense systems protect against bacterial threats. Curr. Gastroenterol. Rep. 6, 355-361 (2004). McCormick, B. A. Bacterial-induced hepoxilin A3 secretion as a pro-inflammatory mediator. FEBS J. 274, 3513-3518 (2007). Mumy, K. L., McCormick, B. A. The role of neutrophils in the event of intestinal inflammation. Curr. Opin. Pharmacol. 9, 697-701 (2009). Chin, A. C., Parkos, C. A. Pathobiology of neutrophil transepithelial migration: implications in mediating epithelial injury. Annu. Rev. Pathol. 2, 111-143 (2007). Segel, G. B., Halterman, M. W., Lichtman, M. A. The paradox of the neutrophil's role in tissue injury. J. Leukoc. Biol. 89, 359-372 (2011). Weiss, S. J. Tissue destruction by neutrophils. N. Engl. J. Med. 320, 365-376 (1989). Hurley, B. P., Thorpe, C. M., Acheson, D. W. Shiga toxin translocation across intestinal epithelial cells is enhanced by neutrophil transmigration. Infect. Immun. 69, 6148-6155 (2001). Kohler, H., et al. Salmonella enterica serovar Typhimurium regulates intercellular junction proteins and facilitates transepithelial neutrophil and bacterial passage. Am. J. Physiol. Gastrointest. Liver Physiol. 293, 178-187 (2007). Gane, J., Stockley, R. Mechanisms of neutrophil transmigration across the vascular endothelium in COPD. Thorax. 67, 553-561 (2012). Grommes, J., Soehnlein, O. Contribution of neutrophils to acute lung injury. Mol. Med. 17, 293-307 (2011). Nakagome, K., Matsushita, S., Nagata, M. Neutrophilic inflammation in severe asthma. Int. Arch. Allergy Immunol.. 158 Suppl 1, 96-102 (2012). Choi, E. Y., Santoso, S., Chavakis, T. Mechanisms of neutrophil transendothelial migration. Front. Biosci. 14, 1596-1605 (2009). Louis, N. A., Campbell, E., Colgan, S. P. Model systems to investigate neutrophil adhesion and chemotaxis. Methods Mol. Biol. 412, 257-270 (2007). Craig, A., Mai, J., Cai, S., Jeyaseelan, S. Neutrophil recruitment to the lungs during bacterial pneumonia. Infect. Immun. 77, 568-575 (2009). Hurley, B. P., McCormick, B. A. Translating tissue culture results into animal models: the case of Salmonella typhimurium. Trends Microbiol. 11, 562-569 (2003). Lee, W. Y., Chin, A. C., Voss, S., Parkos, C. A. In vitro neutrophil transepithelial migration. Methods Mol. Biol. 341, 205-215 (2006). Hurley, B. P., Siccardi, D., Mrsny, R. J., McCormick, B. A. Polymorphonuclear cell transmigration induced by Pseudomonas aeruginosa requires the eicosanoid hepoxilin A3. J. Immunol. 173, 5712-5720 (2004). McCormick, B. A., Colgan, S. P., Delp-Archer, C., Miller, S. I., Madara, J. L. Salmonella typhimurium attachment to human intestinal epithelial monolayers: transcellular signalling to subepithelial neutrophils. J. Cell Biol. 123, 895-907 (1993). McCormick, B. A., et al. Surface attachment of Salmonella typhimurium to intestinal epithelia imprints the subepithelial matrix with gradients chemotactic for neutrophils. J. Cell Biol. 131, 1599-1608 (1995). Mrsny, R. J., et al. Identification of hepoxilin A3 in inflammatory events: a required role in neutrophil migration across intestinal epithelia. Proc. Natl. Acad. Sci. U.S.A. 101, 7421-7426 (2004). Tamang, D. L., et al. Hepoxilin A(3) facilitates neutrophilic breach of lipoxygenase-expressing airway epithelial barriers. J. Immunol. 189, 4960-4969 (2012). McCormick, B. A., Parkos, C. A., Colgan, S. P., Carnes, D. K., Madara, J. L. Apical secretion of a pathogen-elicited epithelial chemoattractant activity in response to surface colonization of intestinal epithelia by Salmonella typhimurium. J. Immunol. 160, 455-466 (1998). Boll, E. J., et al. Enteroaggregative Escherichia coli promotes transepithelial migration of neutrophils through a conserved 12-lipoxygenase pathway. Cell Microbiol. 14, 120-132 (2012). Hurley, B. P., et al. The two-component sensor response regulator RoxS/RoxR plays a role in Pseudomonas aeruginosa interactions with airway epithelial cells. Microbes Infect. 12, 190-198 (2010). Hurley, B. P., Williams, N. L., McCormick, B. A. Involvement of phospholipase A2 in Pseudomonas aeruginosa-mediated PMN transepithelial migration. Am. J. Physiol. Lung Cell Mol. Physiol. 290, L703-L709 (2006). McCormick, B. A., Siber, A. M., Maurelli, A. T. Requirement of the Shigella flexneri virulence plasmid in the ability to induce trafficking of neutrophils across polarized monolayers of the intestinal epithelium. Infect. Immun. 66, 4237-4243 (1998). Savkovic, S. D., Koutsouris, A., Hecht, G. Attachment of a noninvasive enteric pathogen, enteropathogenic Escherichia coli, to cultured human intestinal epithelial monolayers induces transmigration of neutrophils. Infect. Immun. 64, 4480-4487 (1996). Agbor, T. A., Demma, Z. C., Mumy, K. L., Bien, J. D., McCormick, B. A. The ERM protein, ezrin, regulates neutrophil transmigration by modulating the apical localization of MRP2 in response to the SipA effector protein during Salmonella typhimurium infection. Cell Microbiol. 13, 2007-2021 (2011). Pazos, M., et al. Multidrug resistance-associated transporter 2 regulates mucosal inflammation by facilitating the synthesis of hepoxilin A3. J. Immunol. 181, 8044-8052 (2008). Agace, W. W., Patarroyo, M., Svensson, M., Carlemalm, E., Svanborg, C. Escherichia coli induces transuroepithelial neutrophil migration by an intercellular adhesion molecule-1-dependent mechanism. Infect. Immun. 63, 4054-4062 (1995). Bhowmick, R., et al. Systemic Disease during Streptococcus pneumoniae Acute Lung Infection Requires 12-Lipoxygenase-Dependent Inflammation. J. Immunol. (2013). Hurley, B. P., Pirzai, W., Mumy, K. L., Gronert, K., McCormick, B. A. Selective eicosanoid-generating capacity of cytoplasmic phospholipase A2 in Pseudomonas aeruginosa-infected epithelial cells. Am. J. Physiol. Lung Cell Mol. Physiol. 300, 286-294 (2011). Hurley, B. P., Sin, A., McCormick, B. A. Adhesion molecules involved in hepoxilin A3-mediated neutrophil transepithelial migration. Clin. Exp. Immunol. 151, 297-305 (2008). Frank, D. W. Research Topic on Pseudomonas aeruginosa, Biology, Genetics, and Host-Pathogen Interactions. Front. Microbiol. 3, 20 (2012). Lyczak, J. B., Cannon, C. L., Pier, G. B. Lung infections associated with cystic fibrosis. Clin. Microbiol. Rev. 15, 194-222 (2002). Bucior, I., Mostov, K., Engel, J. N. Pseudomonas aeruginosa-mediated damage requires distinct receptors at the apical and basolateral surfaces of the polarized epithelium. Infect. Immun. 78, 939-953 (2010). Kierbel, A., et al. Pseudomonas aeruginosa exploits a PIP3-dependent pathway to transform apical into basolateral membrane. J. Cell Biol. 177, 21-27 (2007). Lee, C. A., et al. A secreted Salmonella protein induces a proinflammatory response in epithelial cells, which promotes neutrophil migration. Proc. Natl. Acad. Sci. U.S.A. 97, 12283-12288 (2000). Zurawski, D. V., Mumy, K. L., Faherty, C. S., McCormick, B. A., Maurelli, A. T. Shigella flexneri type III secretion system effectors OspB and OspF target the nucleus to downregulate the host inflammatory response via interactions with retinoblastoma protein. Mol. Microbiol. 71, 350-368 (2009). Brazil, J. C., et al. Neutrophil migration across intestinal epithelium: evidence for a role of CD44 in regulating detachment of migrating cells from the luminal surface. J. Immunol. 185, 7026-7036 (2010). Lawrence, D. W., et al. Antiadhesive role of apical decay-accelerating factor (CD55) in human neutrophil transmigration across mucosal epithelia. J. Exp. Med. 198, 999-1010 (2003). Hodges, K., Hecht, G. Interspecies communication in the gut, from bacterial delivery to host-cell response. J. Physiol. 590, 433-440 (2012).